"If you are looking for a strong heavy duty toilet paper holder look no further. This is as good as vandal proof gets." "I have been purchasing Vandal Stop Products for about 20 years. Nothing else will go into my park designs or remodels. If something breaks, VSP repairs it. We receive funds to construct or improve parks. It is very important that we use the longest lasting fixtures in them, since there are not a lot of funds for maintenance and replacement. We chose wisely. That's why we choose Vandal Stop Products." Cities today are on the forefront of dealing with how to handle large populations of transient and homeless populations. More than ever before, the issue of how to balance the personal freedoms of the individual with the need to provide safe and clean environments to cities continues to remain at the forefront of concerns for city officials. Providing safe and clean restroom facilities for citizens has been hampered by individuals that take advantage of such facilities availability to commit crime and cause damage. 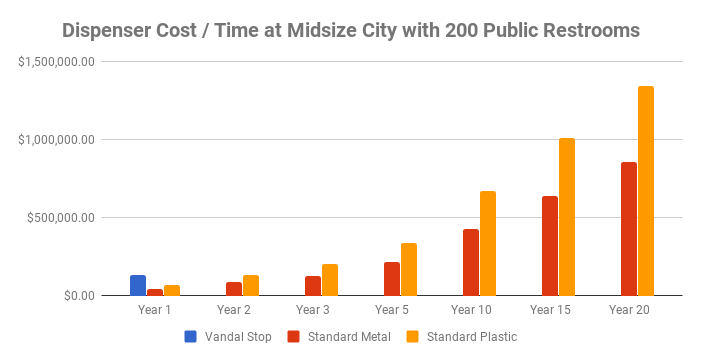 We can't stop all forms of vandalism that occur in public facilities but we can help to minimize the cost and impact to city budgets and citizens when attacks do occur. Our line of heavy duty, stainless steel restroom fixtures is ideal for public spaces where high transient and homeless populations are expected to use the facilities. Starting with our heavy duty, 12 gauge stainless steel, our selection of material is unmatched by anyone else in the industry. We also work hard to develop designs that make it difficult to impossible for bulk paper theft to occur. An average Jumbo Roll today costs $5.00 and a bottle of foaming soap liquid can cost as much as $20 or more. Keeping these supplies where they are supposed to be accessible for customers is a challenge that Vandal Stop is able to rise to. Our designs incorporate locks designed to be used with heavy duty padlocks to ensure that fixtures cannot be opened and expensive supplies are pilfered. We also incorporate features that ensure our dispensers stay on the wall by utilizing heavy duty 3/8" mounting hardware with several mounting holes to give unmatched strength. The difference in our products adds up quickly in a short amount of time. In heavily vandalized / compromised facilities, our solutions can often pay for themselves within a couple of years. This is because the true cost of vandalism isn't the replacement cost of broken fixtures but the additional maintenance cost to service / repair facilities. In today's tight budgets and high labor costs, by the time fuel, insurance, transportation time, and other factors the estimated cost to repair / replace a broken dispenser can be as much as $50.00 per incident. This starts to add up quickly throughout the year and will eat into the time and budget of other competing priorities.